According to newspaper accounts, G.L. Huyett was founded in 1899 by a German immigrant named Guy Lamson Huyett when he purchased the hardware stock of the old Globe department store and moved its contents into an old hotel on Main Street in Minneapolis, KS. In its earliest days, G.L. Huyett operated as a general line retail hardware store selling common goods to the early settlers of land that was generally referred to as the “Great American Desert” in the heart of the Midwest. Guy, a resourceful businessman, incorporated the business in 1906 – the date we trace to our founding over 100 years ago – making G.L. Huyett one of the oldest continuously operating businesses in North America. Many of the Company’s early customers were farmers. Minneapolis was and still is a farming community located in the Great Plains of Kansas, just 50 miles from the geographical center of the United States. Through time, G.L. Huyett became known as the originator of the machinery bushing, a part considered for its precision and difficult manufacture. Machine bushings were used to take up slack on shafts that were loosened by the rough terrain of America’s farm belt. As his business prospered, Guy adventurously hitched a team of horses to the old hotel and dragged the Company south from Main Street to a new location ¼ of a mile down South Concord Street so that the business would be closer to the local rail spur. “The Old Tin Shed,” as it was affectionately known, served as shelter for our entire Company until 1998. In 1930, Guy sold the business to Missouri native Henry Hahn. At the time the Company only had six accounts. During the Great Depression, Farmers and businessmen alike experienced both the economic impact of the Depression and the harsh environmental effects of the Dust Bowl. Kansan’s proved to be a resilient and hardened people who dealt with adversity in positive and resourceful methods. Henry sold alfalfa seed to supplement the lost hardware sales in order to keep the business running. In 1948, Henry passed the business over to his son, Louis, who was a shrewd businessman and a notorious entrepreneur. In addition to G.L. Huyett, he also owned a gas station, drive-in restaurant, and accumulated 2,000 acres of farmland. To help bundle parts for customers, local residents were known to gather on Sunday afternoon’s under a big tree and count machinery bushings into bundles of 10’s or 25’s and wire them up while sipping whiskey. This group was affectionately known as the "South Side Sunday Sipper’s Society," or the "SSSSS." In 1980, G.L. Huyett was ceded to Bob and Dolly Hahn. Together the husband and wife team instilled heart and soul into the operation. Under their guidance, the Company prospered. Bob took to the road to develop new relationships, acquire new customers, and expand G.L. 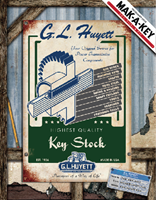 Huyett’s product lines to include, among other things, pins, keystock, grease fittings, snap rings, and more. Bob worked days packing and shipping orders and answering the phone; Dolly worked nights pounding out invoices on a Smith Corona typewriter. Sometimes Bob would meet Dolly going to bed while Dolly was arising to start typing. Dolly had a good mind for finance and a propensity towards thrift. In fact, some customers were known to “appreciate” Dolly’s penny-pinching ways and would mail coins taped to postcards so that Dolly would stop calling to collect for small billing differences. It was during the 80’s that Bob and Dolly hired their first full-time employee, Greg Pieschl – a local resident, who was responsible for warehouse operations including inventory receipt, putaway, and order fulfillment. Recognizing the incredible potential of G.L. Huyett, Tim and Carol began adding staff and product lines necessary to grow the business. For the next five years, the Company operated from a series of metal sheds near downtown Minneapolis. The first computers were purchased to keep up with technology and internal controls were established. The Company began resourcefully sourcing parts internationally and developed an extraordinary entrepreneurial approach to sales that has proven to be an important component of our value proposition to this day. Emulating Dolly Hahn’s affinity for thrift, used mobile homes were purchased and gutted for use as office space. Though G.L. Huyett’s growth phase was in full swing, early conditions were sparse and employees were subject to harsh elements. “Bootstraps” was the mantra, and logistics included using the street as a loading dock. 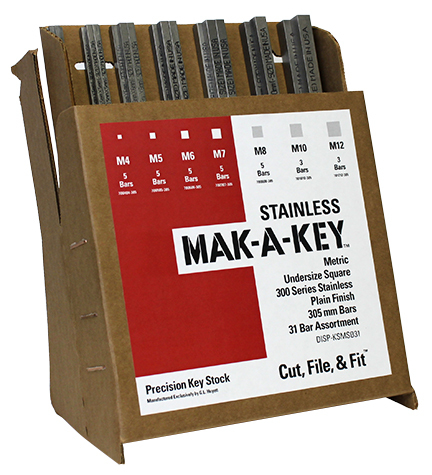 In the mid-90's, a pick-and-pack system was introduced in the warehouse to expedite order handling. Over time, the Company added additional departments and specialized staff to handle receiving and putaway, quality assurance, manufacturing, administration, purchasing, advertising, human resources, information systems, product development, maintenance, information technology, internal and external sales and customer service, and operations. With few competitors in the non-threaded fastener distribution industry, one of our greater challenges was increasing awareness and visibility. Following in the footsteps of Mr. Huyett and the Hahn's, we continued to develop and distribute line cards, tear sheets, parts lists, flyers, and brochures promoting our business, products, and services. In 1996, we published our first catalog featuring grease fittings. At 40+ pages, it was an adventurous undertaking that sought to do more than just list our products and prices, but was designed to provide educational material intended to help our customers make better buying decisions. Within a few years, we released a series of catalogs and line cards offering the most comprehensive, informative, and complete inventories of non-threaded fasteners the world has ever known. With continued success came new opportunities. Needing more space to operate, plans were drawn, crews were hired, and ground was broke for a new 25,000 square foot building in a wheat field in the Minneapolis Industrial Park. Construction included the moving and installing one of the massive spherical boulders found in Rock City, KS, into the front yard of our new home. While the new building provided us the opportunity to grow, our orientation to our past is maintained through the museum in our lobby. After the new G.L. Huyett facility was completed in 1998, continued enhancements were implemented to serve the needs of our customers and employees. In 1998, we introduced our first employee’s benefits package. It consisted of health insurance, life insurance, eye and dental care, a 401k retirement package, and profit sharing. We still offer these benefits today but have expanded and evolved our benefit offerings in order to meet the needs of our employees and remain competitive in today’s job market. Four years later, a second 25,000 square foot addition was added that allowed the Company the room it needed to expand both the sales and operations area and install the first of G.L. Huyett’s manufacturing operations that would allow us to custom manufacture and distribute keystock, machine keys, pins, and other product lines onsite to our customers’ specifications. To this day, we continue to look for ways to better serve our customers and have plans in store for further expansion. The Company grew to 100 employees in the summer of 2004. To commemorate the occasion, a community celebration was held to acknowledge this milestone. Additional office and warehouse space was acquired to expand the needs of the Company. The new facility, located 5 miles west of the primary facility on the west end of Minneapolis, provided much needed room to house a Product Development team, Information Systems, Information Technology, and an in-house Advertising Department. An additional 50,000 square feet of warehouse space allowed for more warehousing and manufacturing space. The addition increased the Company’s footprint to over 65,000 total square feet of operating space. On August 12, 2006 the community and supporters of the Company gathered in a wheat field adjacent to the headquarters to celebrate the Centennial of G.L. Huyett. Though we’re 18.9 miles north of the I-70 and I-135 exchange, and a little off the beaten path, we are proud residents of the Minneapolis community. Wanting to give back to our communities, G.L. Huyett Charities and Project Drive were founded as part of a comprehensive community improvement program intended to serve the needs of nonprofit organizations within a 50-mile radius of Minneapolis, KS. Each year, grants are awarded to a nonprofit individuals, institutions, or organizations seeking to improve a North Central Kansas community. G.L. Huyett has grown into a highly entrepreneurial enterprise with an interest in personal improvement, professional development, and commitment to community. We are working to become a World Class Manufacturer and Master distributor of Non-Threaded Fasteners and Grease Fittings. We are also implementing new software to improve our operation and enhance customer service. New investments in our manufacturing assets, our fastest growing division, are on-going. In 2014 we attained ISO 9001:2008 certification, which is a driven-from-within acknowledgement of our award winning quality and service. Though we still share the entrepreneurial spirit of our founder, G.L. Huyett has steadily evolved to become more than a parts company. We’re a people business comprised of professionals who hold each other accountable to live and work in a Culture of Excellence. G.L. Huyett is a business of the heart. Our job is an intensely personal one that we take very seriously. We call this our “Way of Life™” and are proud to have you, our customers, vendors, and employees as a part of our lives. Our job is to make your job easier and we thank you for the opportunity. Our story isn’t unique…and that is exactly what we love about it. It is a story you have heard a hundred times before…a story that is filled with human drama, pain, struggle, and triumph. It is a story lived by millions of lucky people. It is the American Dream. For the O’Keeffe’s, G.L. Huyett was and continues to be a vocation of which they take great pride in fostering. They believed that the Company has an obligation to provide opportunities for its employees to grow and prosper. Equally important is their desire for the Company to serve the community by providing jobs and career opportunities and through volunteer and philanthropic efforts.